Our mantra at Work-Bench, which you can see printed in vinyl right when you enter our workspace, is that great things happen at the intersection of suits and hoodies. 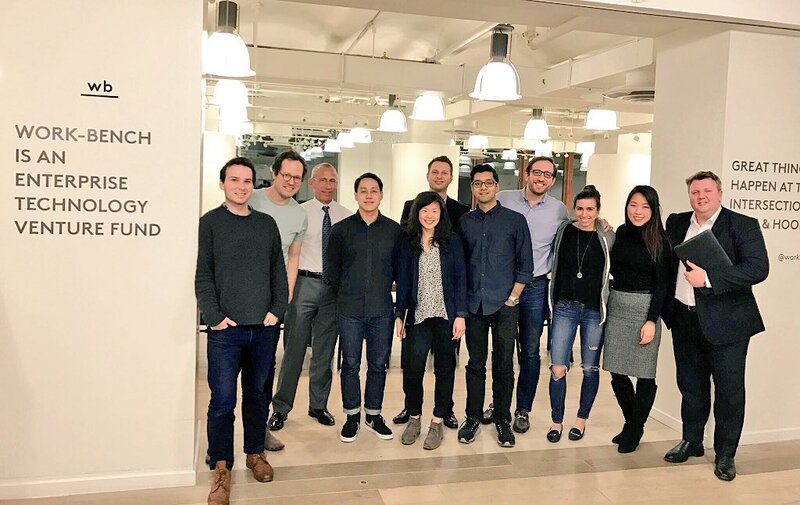 I don’t think that a company of ours has ever better exemplified this more than Merlon Intelligence, which is why we’re thrilled to announce that Work-Bench is joining in their $7.65M raise led by Data Collective with participation from Fenway Summer and Nyca Partners. Too often companies from the Valley and beyond approach Wall Street thinking that they can solve their problems better, faster, and cheaper, however they usually lack the necessary context and domain expertise to fully appreciate the problem at hand (including existing tooling and workflows). When we come across those rare founders who have an extraordinary vision for how the world should be and who pair it with deep customer empathy and an ability to execute, it gets us excited. Such is the case with Merlon Intelligence, where one day last year we got a call from someone at a bank we work closely with, who said that we had to check out an incredible new startup solving Anti-Money Laundering (AML) and Know Your Customer (KYC) compliance unlike anything they’d seen before in the market. Merlon Intelligence was founded by Bradford Cross, a founding partner of DCVC and one of the top AI entrepreneurs & investors out there. He was previously the CEO of Prismatic (acquired by LinkedIn) and Flightcaster, where he honed his tech chops as leader in machine learning. It takes a special kind of person to wake up each day and have a burning desire to rid bank KYC processes of their inefficiencies, and in Bradford we've found that person. His quest for knowledge began 18 months before starting the company. He used his network to meet endless financial services executives and ask "why" a lot. As things began piecing together he knew what he had to build. This led Bradford to Konrad Alt, the yin to his yang. Konrad was most recently the COO of Promontory, the large regulatory services firm that was acquired by IBM, where he served as an advisor on critical regulatory and risk management issues to numerous major financial institutions. Konrad has a storied career in the financial services world and was doing fintech before fintech was a thing. He went through the ride at Providian in their meteoric growth alongside Capital One as their SVP and Chief Public Policy Officer, and was also at the US Department of the Treasury where he served as the second-ranking official at the Office of the Comptroller of the Currency. What’s so cool about Konrad joining Merlon as COO is that you’re combining best-of-breed machine learning with top domain expertise. When you have tech chops, customer empathy, and deep insights into what the problems are, then you can solve meaningful problems in the enterprise and take on legacy incumbents and fellow startups alike. Given their financial services focus, Merlon is going to continue growing their already impressive team out of Work-Bench’s office in NYC, so give us a shout if you’d like to learn more and get connected. Globally, financial institutions spend on average $60 million each to meet KYC requirements, and even crazier is that some financial institutions spend $500M (!) on KYC and Customer Due Diligence according to a Thomson Reuters KYC survey. Mainly the spend is with legacy providers who aren’t leveraging the latest technologies for net new efficiencies. If we look at KYC alone, there’s five or six different systems a compliance analyst will have to use today. None of them are connected. The analyst is clicking through, taking findings from one, plugging them into another – it’s the epitome of inefficiency. So we were looking for software that could aggregate these disparate tools and leverage machine learning to reduce false positives, because there’s a huge human component, and that’s a strain on budgets. You have this perfect storm where financial institutions are more and more heavily regulated, they need to comply, and there’s a very heavy human and technology component – but a lot of the tools are not leveraging best practices from any buzzword you want to throw out across machine learning, AI, natural language processing, etc. While this has led the broader Regtech space to become fairly crowded (take a peek at CBInsights’ February 2017 Regtech Market Map for a gist), no one brings the latest technological advances to bear to meaningfully improve AML and KYC workflows like Merlon does. Merlon uses machine learning, capturing all analyst interactions in order to surface up highest risk items first and streamlines the investigation process by exposing links between all people and business entities. Merlon can highlight risks and suspicious patterns that emerge in transaction streams, and allow analysts to automatically generate reports, further saving valuable time. The product also provides comprehensive archiving of data & decisions through an audit trail, policy controls for management, and documentation for regulators. An interesting competitive moat is that Merlon will leverage cross-bank anonymized data to improve the experience for everyone on the platform and serve as a public utility to reduce false positives for the industry at large. With each successive click by a compliance analyst to label a new piece of data, the system will get smarter, and all users across all customers will benefit. The scale and impact of this approach really excites us, and the beauty of the approach is in how logical it is. We’re thrilled to participate in this $7.65M round with Data Collective, Fenway Summer, and NYCA. These funds bring best of breed knowledge in machine learning, financial services, and the regulatory world to the table, and we couldn’t be more excited for what’s ahead for Merlon Intelligence. See more coverage in American Banker and TechCrunch, and feel free to share here! Jonathan is a geek who dreams about how innovations in enterprise technology can improve the way business is done. Jonathan leads the NY Enterprise Tech Meetup and at Work-Bench invests in top early stage enterprise tech companies.